To maintain tissue homeostasis, many adult organs harbour pools of stem cells that divide and differentiate to replenish cells that are lost through ageing and/or injury. How these division and differentiation events are regulated is an important open question in biology. Due to its genetic tractability, the adult Drosophila midgut (analogous to the mammalian small intestine) has been a powerful model system for identifying the conserved signalling pathways underlying both normal tissue homeostasis and its dysfunction during disease, infection, and ageing. Nonetheless, without methods to support extended live imaging of this tissue (longer than 90min), it has been difficult to use this powerful genetic model to study the cell biology and signalling dynamics underlying stem-cell-based homeostasis. The authors of this preprint create a new and vastly improved protocol for imaging the midgut. They first stabilize the abdomen of the animal while providing a feeding tube; then they remove part of the dorsal cuticle, immerse this exposed part in media, and image through this media (Fig 1). The authors develop an image processing pipeline to compensate for global movements of the tissue and use a combination of fluorescent genetic markers and quantification of nuclear size to simultaneously identify and quantify the dynamics of different midgut cell types on a tissue scale for 12-16 hrs. Fig 1: Method schematic (Fig 1A-C of the preprint): (A) Illustration of the fly digestive track; midgut in white. (B) Mounting the animal for imaging (with an upright microscope). The midgut is accessed through a hole in the cuticle, and the animal is fed through a tube. (C) Steps in sample preparation. Movie S5 from the preprint showing the a ‘fate sensor’ midgut (esgGal4, UAS-his2b::CFP, GBE-Su(H)-GFP:nls; ubi-his2av::mRFP). With the combination of nuclear size and genetic labels, four midgut cell types can be identified and tracked: stem cells (red), enteroblasts (yellow-green), enterocytes (gray, polyploid – and thus larger), and enteroendocrine cells (gray, diploid – and thus smaller). The nucleus rapidly shoots out of the tissue toward the lumen before recoiling back toward the epithelial surface. Dividing stem cells can rapidly reorient before division. Neighbouring enteroblasts influence stem cell division orientation. Notch activation and stem cell differentiation can be directly observed live (Fig 2) and occurs over a time-scale of hours (based on observation of 5 events). Proximity between stem cell siblings after division does not correlate with Notch activity. The kinetics of Notch activation and cell differentiation imply a latency period after a cell is born, whereby its differentiation is delayed for several hours. Fig 2: Direct observation of Notch activation during cell fate transitions (Fig 5D from the preprint). GBE-Su(H)-GFP:nls reports Notch transcriptional activity, while ubi-his2av::mRFP provides a reference signal. Cells additionally express esg>his2ab::CFP to mark progenitor cells. 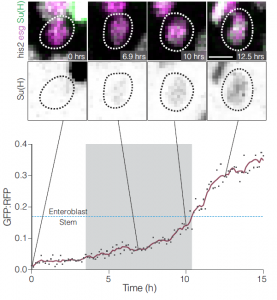 The authors use the GFP:RFP ratio to quantify Notch activation and directly observe transitions between stem and enteroblast states, finding that these transitions require several hours (2.4-6.9hrs). In my humble opinion, methods papers are where the preprint servers are especially valuable. Getting a new method out in the open as soon as possible is a great thing. Included in this paper are videos and detailed diagrams to help the reader use the method. Slight modifications may enable imaging of different parts of the adult fly, making the approach potentially even more widely applicable. 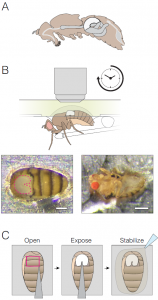 Drosophila genetics has proven to be extremely powerful over the decades, but I’m excited to see more and more recent efforts to add live imaging to the toolbox – from the embryo, to the brain, wing disc, and now gut. While this paper is first and foremost a method paper, there’s also a lot of tantalizing new biology presented. Their new data demonstrate how certain kinds of information can really only be obtained by direct observation over time, something I myself have been aiming for in my own work. 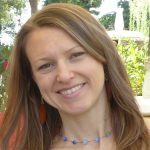 The authors provide solid, valuable characterization of the dynamics—but nevertheless their data seem to generate more questions than answers. Thus, I think the best is yet to come. There is great potential for the live imaging approach to synergize with existing genetic tools in Drosophila to make really fundamental mechanistic discoveries. In principle, their techniques may also be combined with laser ablation, to probe the influence of mechanical forces, and pharmacological perturbations to rapidly, locally, and reversibly inhibit various proteins. What in the world is going on with the nucleus in those extruding cells? Since the duration of stem cell sibling contact (at least at the level of the nucleus) does not seem to be important, what regulates the when and whether Notch is activated? Related question: are there filopodia-like protrusions in these cells that may signal long distances through Notch, as in the Drosophila notum? What is the molecular mechanism underlying the apparent latency phase in stem cell differentiation? What happens to these dynamics upon injury, infection, ageing, and with varying diets? Related comment: another recent preprint demonstrates that dietary lipids affect cell differentiation and Notch signalling in the midgut (Obniski et al 2018: https://www.biorxiv.org/content/early/2018/02/28/273813). This is just one example of the interesting perturbations that can be now studied live using the techniques from O’Brien and colleagues. Cohen M, Georgiou M, Stevenson NL, Miodownik M, Baum B. “Dynamic filopodia transmit intermittent Delta-Notch signaling to drive pattern refinement during lateral inhibition.” Dev Cell. 2010. doi: 10.1016/j.devcel.2010.06.006. Gervais L, Bardin AJ. “Tissue homeostasis and aging: new insight from the fly intestine.” Curr Opin Cell Biol. 2017. doi: 10.1016/j.ceb.2017.06.005. Guo Z, Lucchetta E, Rafel N, Ohlstein B.“Maintenance of the adult Drosophila intestine: all roads lead to homeostasis.” Curr Opin Genet Dev. 2016. doi: 10.1016/j.gde.2016.06.009.